Sumac, the Middle Eastern pantry staple is a key ingredient in many Lebanese recipes. It is also a necessity for the spice blend, za’atar, usually made with sumac, toasted sesame seeds and thyme, which is sold premixed like chili powder. Sumac has this astringent taste of tangy lemon, it’s made from dried ground berries of the sumac bush. 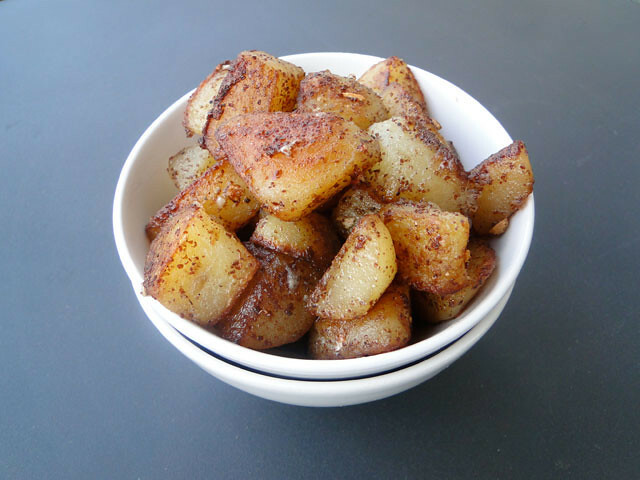 The recipe of sumac flavored roasted potatoes is so easy to prepare, and they make a great accompaniment for any main dish. 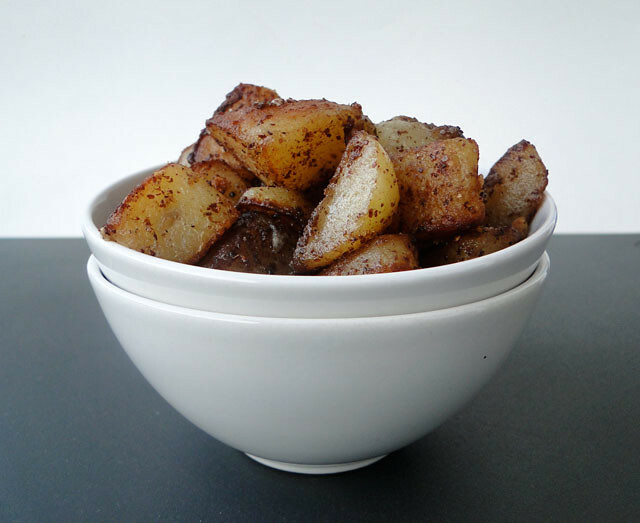 Sprinkled with sumac, olive oil and garlic, the potatoes are roasted until golden and crispy. Peel the potatoes, then wash them. Cut them into big cubes. Toss them with olive oil, and cook them in the oven at 400ºF (200ºC) until cooked and lightly browned. In a bowl, mix the sumac, salt, pepper, garlic and 1 tbsp olive oil. 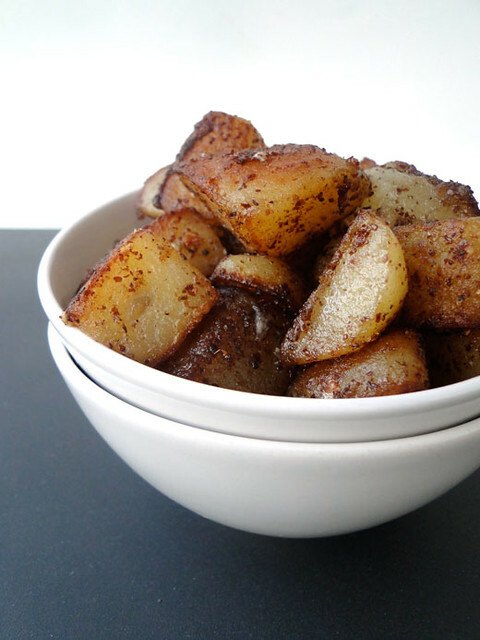 Toss the potatoes with this mixture and cook them 5 minutes until golden and crispy. Pelez les pommes de terre. Lavez-les et coupez-les en grands cubes. Badigeonnez-les de huile d'olive et enfournez-les à 200ºC jusqu'à ce qu'elles soient légèrement dorées et cuites. Dans un bol, mélnagez le sumac, le sel, le poivre, l'ail et 1 càs d'olive. Ajoutez ce mélange aux pommes de terre et laissez cuire au four 5 mn de plus jusqu'à ce qu'elles soient dorées et croustillantes. Sumac and potatoes, that's awesome! Sumac has such great flavor, but I don't think to use it often enough. This sounds great. Can't wait to try it! What an awesome flavored potato dish. Very creative. Haven't used sumac in potatoes before...I am going to give the recipe a try. This makes a great sidedish. Easy and delicious one..looks amazing. What a wonderfully simple recipe. You've introduced me to another spice I'm unfamiliar with. I'll be on the look out for it! I just bought some Sumac the other day and was waiting to see how I could use it. These sound like lovely potatoes and I will try them soon. This sounds wonderful and looks amazing. I'll sprinkle some sumac next time on potatoes. I've never used sumac with potatos. I usally used it with chicken. I love the taste of it. Never thought of adding it to potatos. Great dish. I have sumac, I have potatoes. I think I'll be having these! Sumac is a lovely spice! However I have discovered it only recently. I've never tried it with potatoes, that seems like a really good idea! I've been wanting to try using sumac. I think I've found my gateway recipe. Thanks. I've never heard of sumac! I love reading your blog. I learn so much. Sounds delicious! I love this, love this, love this. I have a full bag of summac fresh from Lebanon that I'm itching to use. Spank you! Sumac is my very favorite spice and we do this all the time at home! except i cook them on the stove. never thought of posting it. I will try roasting it next time. Pick this up on your twitter feed. I just purchased sumac spice the other day wanting to try it on something. This recipe should not mask trying out the flavor. Thank for posting it. I will definitely try this tonight. But gotta buy the ingredients needed for this from the super market first! 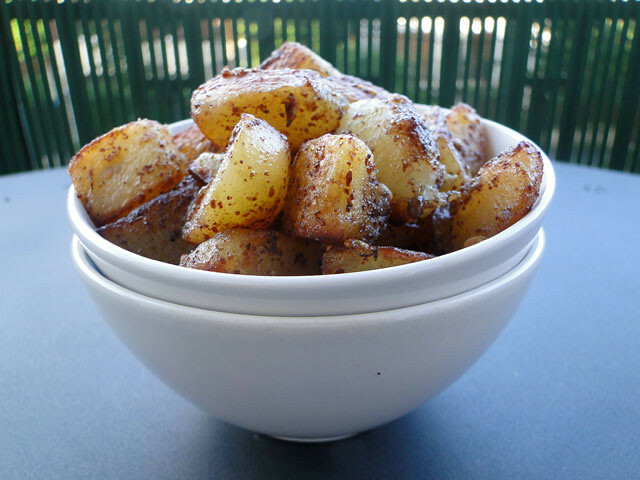 J'ai justement quelques pommes de terre cuites qui ne demandaient qu'à être rissolées, cette recette tombe à point !